I went downtown today (17 Dec) to talk with Globe, again, about my internet and phone being out, again. After a lengthy wait and noticing some weird things going on at the Globe office, I headed over to Chowkit, where Lita was waiting on me. I’ve already got a story written about before I headed to Globe, so I’ll do another one on my experience while there. In the meantime, here is my Chowkit story. 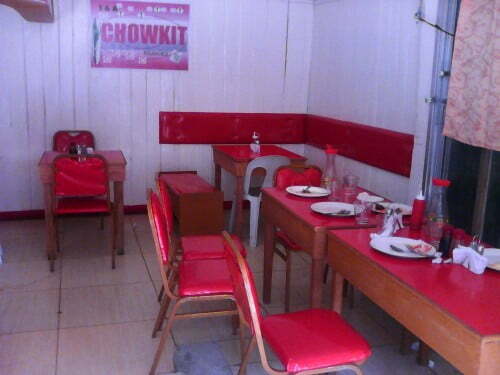 It seems that the name Chowkit, which is currently being used for the restaurant, will also be used for the store and the internet café. There is no name on either the store or internet café as of yet. I suppose that it’s a license issue and it’s cheaper to have all 3 under 1 name versus 3 different names. 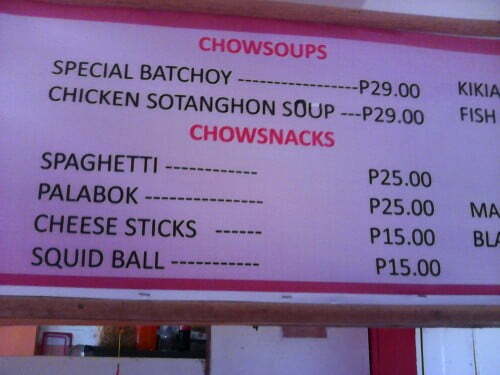 Chowkit Inc. will be run by our nieces, the daughters of Mar and Ludy, Marge and Marianne. Marge usually takes care of the store and Marianne the restaurant. The internet café is currently being relocated across the street (next to the store) because its old location is becoming the restaurant extension. The daughter in law, Robbie, who lives here in Bagacay behind us, was taking care of the internet café before, so maybe that will continue to be so after the relocation. I remembered to bring the camera with me so I can take pictures of Chowkit and the surrounding area. I had an issue to discuss with Globe about the phone is why I remembered. The store is where I hope to be able to get some expat get-togethers at once in a while. The beer (or sodas) are cold and inexpensive. The SML is only P30 and the SMB is only P27. The only Red Horse they have is the liter bottle for P70. I can always just use a glass to pour the Red Horse in if I’m going to drink a liter anyway. I have, and even once since being here, just drank from the liter bottle. You get strange looks when you do that. Sorry I don’t know how much the soda is, I don’t buy much except at home, but I do know it’s the standard price for soda in the area. 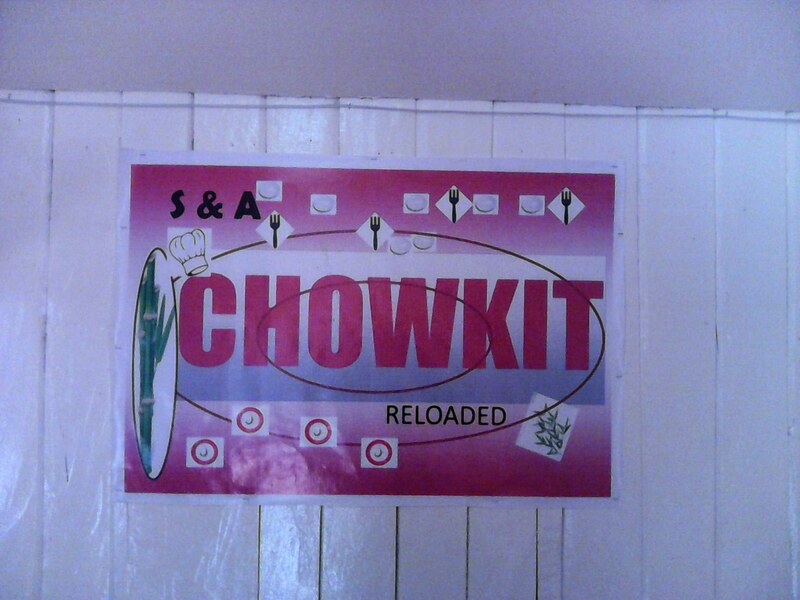 Of course while drinking there, the Chowkit restaurant would be available to purchase eats. They do have hot wings and little cheese sticks. Also with a day or 2 notice, we could get some chicken rolls. I like all 3 of those items and if y’all know me, even though I’m a ‘big’ guy, I’m a bit picky as to what I eat. Naturally the food would be delivered to you. I also like the prices that they have on some of their items. I got a couple of pictures of the menu, but not the whole menu. 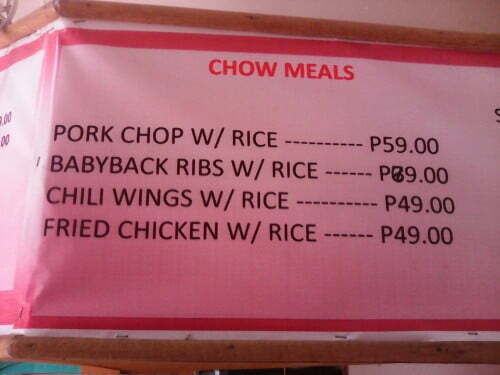 It is really not that big of a menu and the chicken rolls are not even on it. That’s just something that I can get them to make for us. Not for free, but they are good. While there I ordered lunch and I got something that I figured guys probably would like. I got their Chili Wings. It’s basically the same as any other hot wings here. They fry the chicken and give you some hot sauce or sweet chili sauce to go with it. I’m going to have to educate them on what real hot wings are like. The taste was good, but I was disappointed with the amount received. 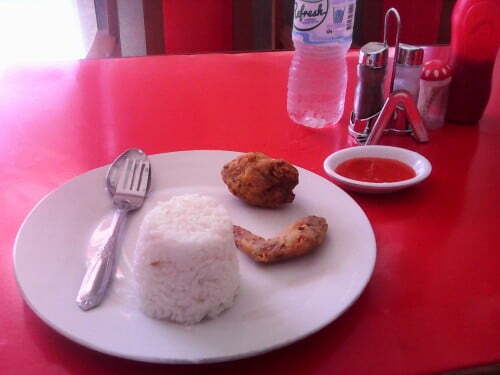 There was only 1 chicken wing (broken and fried in 2 pieces) and a mound of rice for P49. I didn’t get their cheese sticks this time, but I’ve had them before and I believe that to be a better deal. For that same P49, you can get about 10 little cheese sticks. I don’t know what they will charge for the chicken rolls, but I’m sure it’s reasonable. I’ll even pay for the chicken rolls the first time. I hope to get them to try ‘different’ wings soon and maybe there will be more choices on that. I mentioned again while there this time about trying to get some expats to hang out there and they are still for it of course. I was told today that the food would not have to be delivered from the restaurant though, because they will soon have a grill in front of the store. It will be easier for us to order and easier for them to deliver. Of course it’s easier for us to spend our money too, but that’s fine. As long as the food is good and the beer (or soda) is cold, spending the money is incidental. It comes with the “being out” experience and as long as we are having a good time, then the small amount that it comes out to should not be a factor. As you can see in the pictures I took, they have a nice covering for diners in case it rains. Their location on Navarro St. is close to the intersection of Asis. At least according to my nephew Marlou it is. I forgot to look while I was there today. Navarro does not have as much traffic as on Magsaysay, where we have been going, to Demetrius, but that could be a good thing. That does mean less people traffic as well as vehicle traffic, so that could be a bad thing. Less chances to raise your hand. If you don’t know what that is, then after hanging with us there one time, you will know. I also took a picture of another restaurant that is right next to the store. That restaurant is larger, but it is not the one belonging to the cousins. That other place may also sell beer, I don’t know for sure, but they have no room to sit out in the open. Besides I couldn’t willfully sit in their restaurant and order the same thing that I could get at the cousin’s place. That would just be wrong, since it is ‘right there’. So when some of you guys are ready, let me know at least a day ahead of time, 2 days would be better for me, and I will inform Marianne to make those chicken rolls. I figure we can at least try it out. If we don’t like it, we can always go back to Demetrius or even another place. I know the relatives would like for us to go there, and so would I, but it has to be a good place for all to enjoy to be most appreciated.